I mentioned on last episode’s Galactic Suburbia that I’m reading a lot of nonfiction at the moment. It’s quite weird for me as I haven’t really read nonfiction for fun in a few years. It’s going through a bit of a reassessment of aspects of my life and my reading is one of them. Basically, I’ve discovered you don’t have to force yourself to do or like things and that (revelation ahead) if you choose not to, you are much happier. Sounds obvious, and yet, not actually how I was running my life for the last decade or more. And so I realised that the reason I’m not finishing books is I am not reading the books that I need to be reading right now – are you a mood reader like me? I have to be in the right frame of mind for certain books and it’s why I tend to travel with more books than I can read in case I’m not in the mood for some. And right now, nonfiction, and nonfiction about craft, seems to be really appealing to me. In Sweater Quest, Adrienne Martini spends a year trying to knit an Alice Starmore jumper. If you’re a knitter, you already know about the complexity of the fair isle and the holy grail that is the Alice Starmore projects. And if you’re not, you probably don’t really care. So suffice to day, in some ways this challenge is akin to the Julie Julia cooking project. And I kinda like me a craft related quest. Maybe if epic fantasy involved some kind of quest across country for maiden silk yarn, I’d like relate more? This book is written in a very friendly tone – similar to the way online knitting blogs are written. Again, if you’re a knitter, you know what I mean, and if you’re not, well, knitters are pretty tech savvy and have many an online community. Because of course, knitting is deeply fascinating but noone said knitters didn’t love to bond over more than just the gorgeous yarn and pattern you’re working on right now. In Sweater Quest, we get to know Adrienne and a bit about who she is as a knitter and a person. 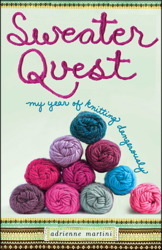 I enjoyed the quest to knit the Starmore but what I enjoyed even more were the truly crunchy questions Adrienne’s journey threw out. The thing about the Starmore is, according to Alice Starmore, you can only knit a Starmore if you use her specified yarn and colour combinations. If you deviate, she (and her lawyers) might just ask you to not call it a Starmore. And the problem is, they don’t actually make the yarn for many of her older patterns anymore. If you aren’t aware of the Starmore controversies and you like yourself a bit of internet drama, then this book is a great introduction to some of the goings on from the early 2000s and will point you in directions to chase up a bit more of that story. Adrienne goes on a journey, both in writing her book and physically as she visits lots of the big name online knitters, asking the question, if she isn’t using Starmore yarn (she had to substitute one or two as she couldn’t chase down all of them), is she knitting a Starmore at all? I don’t know that I every really felt like I got an answer to that question. But I loved the thinking beyond that – a designer dreams up a knitted item and writes the pattern, knitters tend to pick that up, change the colour and/or the yarn brand, maybe change the cable here or there, add length, reduce length, change the collar or the sleeve… at what point does the end product no longer resemble the intent? When is it no longer the pattern? And more than that, what does a designer own? I loved thinking these ideas over in terms of how they translated to writing and publishing and plagiarism. But I also loved the ideas as they applied to knitting. For years, I have been laughing at new knitters online who would never even have thought that you could look at a pattern and knit it in red instead of yellow – that they would hunt around for red jumpers if that’s what they were intending to knit, rather than find a pattern they liked and then just change the colour of the wool. Here in Australia, it’s only been really recently (and even more recent here in WA), that the yarn brand specified in the patterns was available to buy, let alone the colour. We are used to substituting not just the colour but the yarn and thus swatching before knitting is obviously a must (nonknitters – first you must work out how the yarn knits out – in terms of tension and so on – by knitting a square of a set number of stitches and then comparing the resulting dimensions to those of the pattern to figure out if you have to add or subtract stitches to be able to knit the resulting size garment). Basically, we are used to *not* using the same colours or yarn brand for knitting. So for me, the idea of Starmore’s, that to knit her jumpers you had to use her wool, was mindboggling. And before the internet and ebay, basically meant you would never be able to knit her work at all. I dunno that I’ve finished thinking through a lot of the ideas from this book. I really enjoyed the food for thought. Recommended to my knitting geek friends. I will totally write you the epic silk yarn fantasy someday.